Thank God the weather is getting nicer -- at least around here -- 'cause this is the perfect track to crank on the highway, or on your iPod as you take a stroll outside. This cut is called "Plastic Love" and it's from Peach Kelli Pop and it's all kinds of wonderful. Recalling both Helen Love and the glory days of riot grrl rock, it's a blast of delightful pop that should make you an instant fan of this band. "Plastic Love" is the newest one from Peach Kelli Pop. It's taken from the upcoming iii, which drops on Burger Records very soon. 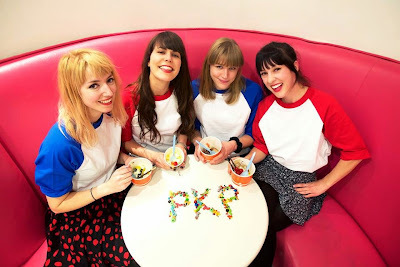 In fact, you can pre-order the new Peach Kelli Pop album here. In the meantime, play "Plastic Love" a few dozen times and then go follow the band on their official Facebook page.